This is a small tutorial for improving the graphics in the game. 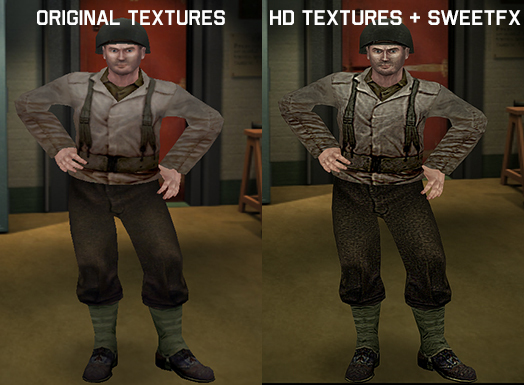 This is a small tutorial for getting better graphics on Medal of Honor: Allied Assault. I tested with the GOG Warchest version and worked. I take no credits for all the files in this tutorial. At the end of the tutorial are some pictures. 2) Delete the file (or make a backup file), then load the game and edit all the in-game setting except the resolution. 6) Save the file and close. Extract all the files in the zip file into the Medal of Honor main folder (the one with the exxecutables). Now you can edit the SweetFX_settings.txt for improving by yourself the settings or download a new preset and see how it works with the game. I tested with the "natural 1.0" settings by r3dfield (created for World at War). After you edited the SweetFX_settings file, save it and enter the game and see if worked. When I edit the unnamedsoldier.cgf, the game still starts at a low resolution, and when i open unnamedsoldier.cfg again, the stuff i just put in it is gone again. am i doing something wrong? Make sure to run the game as administrator by right clicking on .exe and checking run as administrator or the custom settings may reset. Shouldn't "seta r_ext_compressed_textures 1" be set to "0"? For all I know, this just lowers the texture quality. Thanks, it worked! How to make crosshair bigger?